Over at Thus Said the LORD, I have an updated essay on the rebuilding of Jerusalem’s wall by Nehemiah. The story of Nehemiah and the wall have much to teach us about the current immigration debate. Did Eve Experience Pregnancy While In Eden? During the discussion of this verse, a student of mine raised the following question: had Eve experienced pregnancy in Eden prior to her expulsion? If not, how then are we to understand this phrase? Good question. The author is clearly comparing the pains Eve will experience as a mortal woman with something else? Could that something else be previous [not so painful] pregnancies? The blue text is translated from a literary figure called an emphatic infinitive1)A grammatical form in which the infinitive of a verb immediately precedes its non-infinitive form, e.g., “to eat you will eat” meaning “surely you will eat” or “certainly you will eat”, etc., . In this case, because this particular infinitive is in the Hiphil stem many (most?) commercial translations render “to-make-many” as “greatly” but “certainly” or “surely” would also be appropriate although I can find no commercial Bible that renders the this infinitive as such. The red text (“I will make many”) is a standard, first person, Hiphil imperfect verb and is almost always translated as ‘I will multiply” or “I will increase”. Taken together, the text reads “greatly will I increase” or “greatly will I multiply“. Both are equally defensible. Well, after much searching I have been unable to find no scholarly research on the idea that Eve had experienced one or more previous pregnancies as indicated by the text2)Of course, this does not mean that scholarly research doesn’t exist. Only that I couldn’t find any. If you are reading this post and know of such a thing, please drop me a line or post a comment.. Indeed, the plot of the narrative is critically based on the idea that Adam and Eve could not procreate prior to gaining the knowledge of good and evil. I have found lots of lay speculation dealing with this question, none of which are grounded in the text of the story. In his magisterial commentary on Genesis (Sarna, 1989, p. 28), Nahun Sarna observes that “intense pain in childbearing is unique to the human species and generally unknown to other female mammals“. This being the case (and it is … see this article in the American Scientist) one explanation – and the one that I favor – is that the author knew of this phenomenon (tho’ not of its scientific explanation), likely having seen domesticated animals experience parturition with nary a whimper. Thus the phrase in 3:16 “greatly increase your pain…” likely refers to Eve’s pain relative to that of other female mammals. There is a pleasing coherence between the God’s treatment of the serpent and His treatment of Eve – both are relative to other animals. 2. ↑ Of course, this does not mean that scholarly research doesn’t exist. Only that I couldn’t find any. If you are reading this post and know of such a thing, please drop me a line or post a comment. The answer may surprise you. I’ve written an article for my students in this fall’s Genesis Creation class I’m teaching this fall. Check it out. 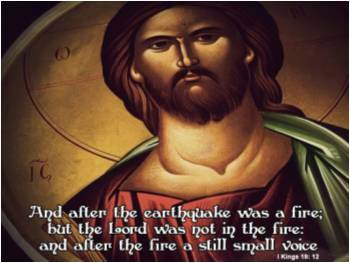 In 1 Kings 19:12, the story of the mighty Yahweh speaking to His prophet Elijah in a “still small voice” in the aftermath of a great storm has stirred the imaginations of squishy clergy of all traditions. Much has been made of the contrast between the gentle God quelling Elijah’s fears on Mr.Horeb, with the imposing God revealing himself to Israel on the same mountain. But to some, what is literary contrast is inconsistency and, where not explained, triggers skepticism. And nowhere, in neither the verse nor its context is this inconsistent view of God explained. Why does the divine author portray God as speaking in a “still small voice” contra everywhere else in the Bible? Unexplained, the story has become an empty vessel into which countless clergy, Bible study teachers, and readers have poured their own meaning into the story. First some context. In this verse, the prophet Elijah is hiding in a cave hoping to escape Queen Jezebel who is out to kill him. Upon hearing the voice in the cave, Elijah runs to the entrance of the cave where God asks, “What are you here for, Elijah?” Elijah answers that he is hiding because his “zealousness for the LORD” has angered Queen Jezebel and much of Israel who now seek his death. While the Hebrew word ‘qol’ can mean ‘voice’ or ‘sound’, it can also mean ‘thunder’ or ‘thunderous voice’ depending on context. When qol is used elsewhere in the Bible, notably in the context of a storm theophany (God appearing during a storm) qol is always translated as “thunderous voice” or “roaring sound”. (e.g., Exodus 19:16). How reasonable is it that this text, a direct parallel to the storm theophany of Exodus, be translated as “small or quiet”? What about the other words? The Hebrew word mamah, translated as ‘quiet’, ‘whisper’, or ‘still’ actually stems from the Hebrew word damim meaning ‘roared’. Likewise daqqah is often interpreted figuratively to mean small. But, the literal meaning of daqqah is to crush – which, of course, is a way of making big things small. But, if this is all there is, so what? What theological difference does this make? In this story, Elijah is (was) competing with the worshippers of Baal. Where Baal speaks thunder, i.e., his voice is the thunder, God speaks thunderous words. The divine author is drawing a very clear, sharp contrast between Baal (thunder) and God (the maker of thunder). Where Baal was (is) the storm, God is the maker of the storm. Storms and fire and earthquake are gods to the worshippers of Baal, but these ‘gods’ are depicted in the Bible, and here in 1 Kings, as preceding our God. Moreover, our God speaks words and we listen, learn, and obey. Baal is simply thunder from which we flee or take cover. What a difference between worshipping the storm and the Maker of the storm – between worshipping the creature and the Creator! NOTE: Genesis 3:8 is similarly misunderstood in much the same way. Take some time and read my tanslation and commentary here.